Or please warm the protector with a hair drier or hot towel util it become soft then put a basin of water or heavy books on it. The 2mm Thick PVC table cover protects your table or tablecloth against scratches, scuffs, stains, spillage while keeping your desk tidy, clean and organized. Eco-friendly PVC material with the characteristics of Waterproof, Non-slip, heat resistant (maximum to 80 degree Celsius). Easy to clear, using a dish cloth to wipe stains or clean it with water. The Clear cover is a bit sticky, NOT recommend to put directly on NEW wooden tops, better to cover on a tablecloth. For SMOOTH AND POLISHED SURFACES such as glass, stoving varnished or marble tops, please use Matt cover instead to avoid air bubbles. Please search this ASIN B073Z6YY9N for matt cover. Perfect for kitchens, dining rooms and office workspaces etc. 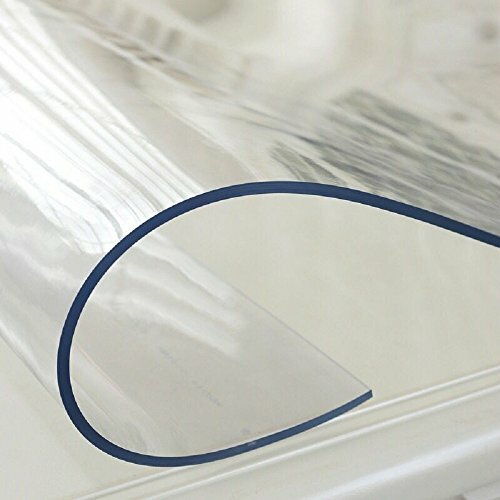 This PVC protector can be cutted to fit your table, you can mark with a pencil the exact measurement and use a sharp knife or scissors to cut. The size received will be extra bigger than actual size because this material will shrink a little after a period of time. CUSTOMIZATION: Please send us your table measurement, we will reply how to order. Please don't order custom size for Prime Order, item Fulfilled by Amazon is unable to be customized. If you have any questions about this product by DiscoverDecor, contact us by completing and submitting the form below. If you are looking for a specif part number, please include it with your message.